Before Pearl Harbor, Georgetown was up there in the Big Time, having played in the 1941 Orange Bowl and being ranked as high as 13th in the country. But after the war was over, all of the smaller Catholic and Jesuit schools began de-emphasizing football, and by the 1950's only Notre Dame was still holding up the Roman banner. 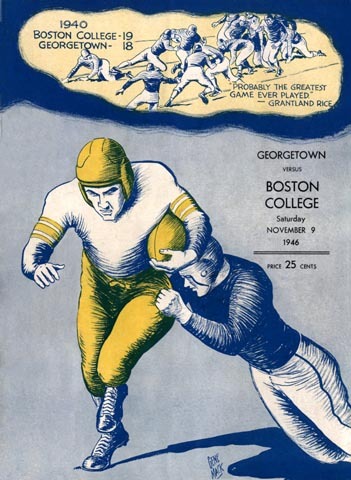 The Hoyas kept up the pretense through 1950, but after that football was strictly a club sport. For the rest of the 20th century, the Big Time was left to the football factories.